Item description: Letter, dated 16 January 1864, from Brigadier General Goode Bryan to General Lafayette McLaws. 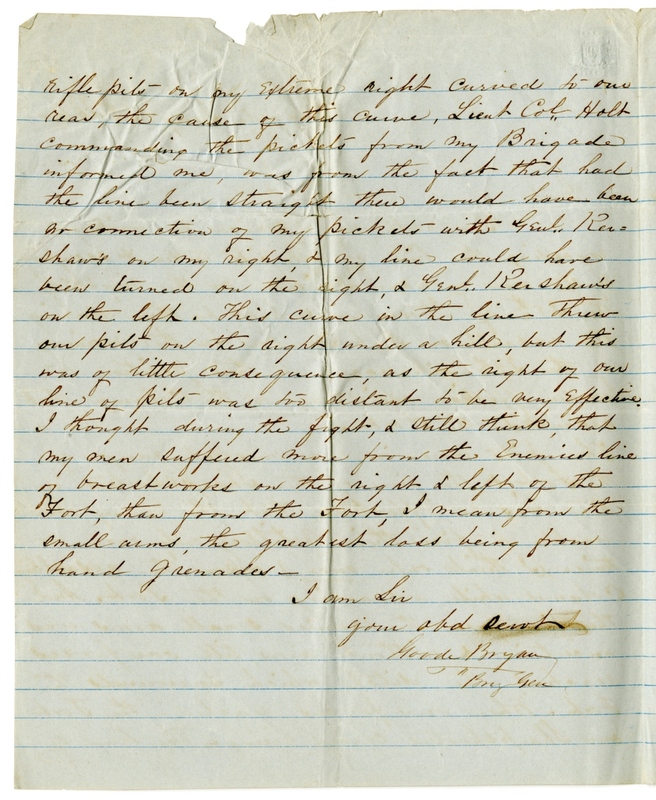 In this letter, Bryan delivers his opinion to McLaws that the Confederate defeat at Fort Sanders (referred to here as Fort London) was not the fault of Lafayette’s Division. Bryan describes the layout of trenches and breastworks surrounding the Fort, as well as the use of small arms and hand grenades by Union forces. Item citation: From folder 10 in the Lafayette McLaws Papers, #472, Southern Historical Collection, The Wilson Library, University of North Carolina at Chapel Hill. You ask my opinion in writing regarding the line of rifle pits taken & occupied by the men of your Division, on the night of the 28th of November & held by them during the assault on Fort London on the morning of the 29th with regards to their position to render effective assistance to the Column that assaulted the Fort. The pits were in easy musket range of the Fort & the fire of the Sharpshooters in them was so effective, that the Enemy were unable to fire their artillery only once or twice, (I think only once) upon the assaulting Column while advancing on the Fort. And the fire from the Enemies small arms was uncertain & without aim, till our forces reached the ditch which surrounds the Fort. When our forces reached the Fort our Sharpshooters ceased firing. The line of rifle pits on my extreme right curved to our rear, the cause of the curve, Lieut. Col. Holt. commanding the pickets from my Brigade informed me, was from the fact that had the line been held straight there would have been no connection of my pickets with Genl Ren-shaw’s on my right, & my line could have been turned on the right, & Genl. Renshaw’s on the left. This curve in the line threw our pits on the right under a hill, but this was of little consequence, as the right of our line of pits was too distant to be very effective. I thought during the fight, & still think, that my men suffered more from the Enemies line of breastworks on the right & left of the Fort, than from the Fort, I mean from the small arms, the greatest loss being from hand grenades. 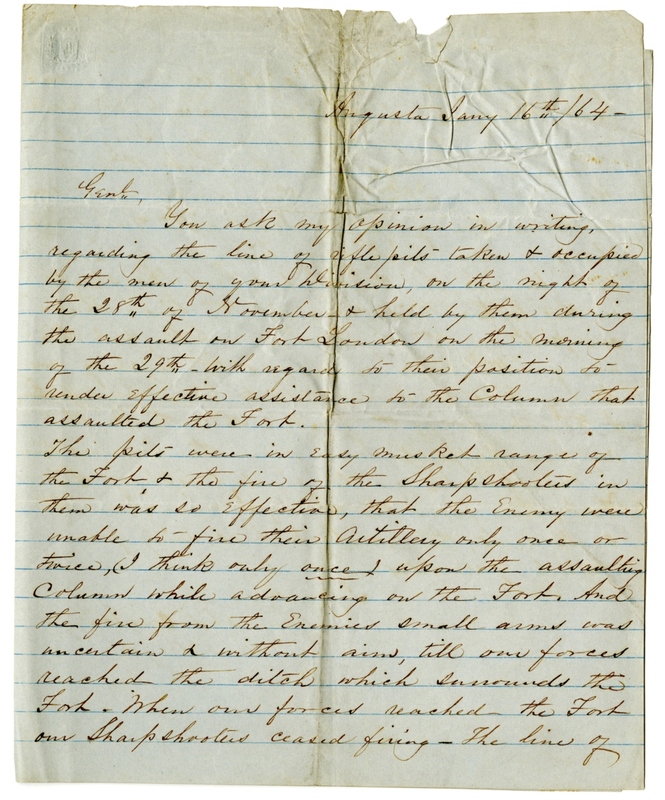 More about this item: General McLaws was court-martialed for failure to support his commander, General Longstreet, during the campaign described in this letter. This entry was posted in Southern Historical Collection and tagged breastworks, East Tennessee, Fort London, Fort Sanders, Goode Bryan, hand grenades, Knoxville Campaign, Lafayette McLaws, small arms, Tennessee, William B. Renshaw. Bookmark the permalink.